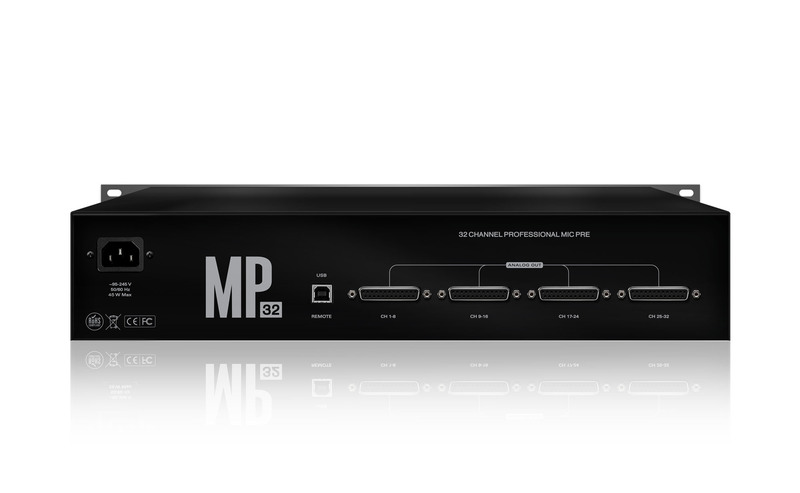 MP32 is a 32-channel console-grade microphone preamp with integrated software remote control and Antelope Audio's exciting new approach to analog circuit design. The rave reviews shared by several top audio engineers regarding the quality of the 12 mic preamps in our portable audio interface Zen Studio urged us to expand further and create a 32-channel mic preamp housed in only two rack spaces. 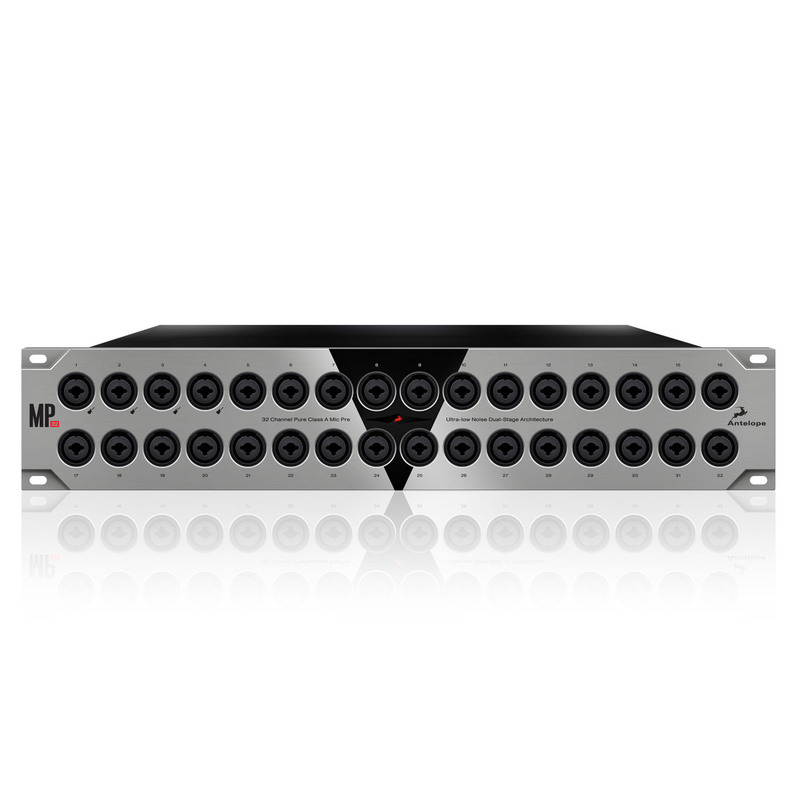 We designed MP32 to be a perfect match for our top-selling audio interface Orion32, this way ensuring a full transparency of the sound and complete integrity of the signal via the whole chain, from the mic pres through the conversion, recording and playback, all of them characterized by the signature Antelope sound. The combination of the Orion32 and MP32 totaling just 3U in rack space make it a perfectly suited solution for studios and live recording where rack space can be a precious commodity. A user-friendly control panel for Mac or Windows allows for easy remote management of the devices input types and mic gain levels. The intuitive software control panel provides fast set up and easy fine-tuning of individual mic preamp gain, as well as the independent assignment of phantom power and mic/line/hi-z switching. 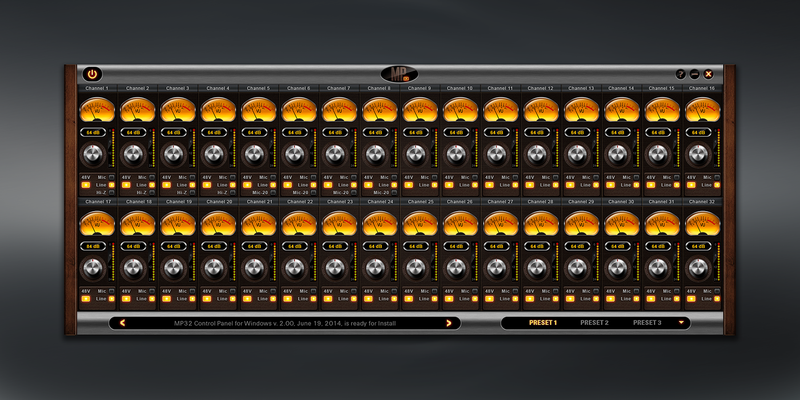 Complex gain structure and preamp settings are made incredibly simple by the user-defined presets, just a mouse click away. In addition, individual V/U style metering allows for instant signal confirmation at a glance of the software.